President Obama threw cold water on a carbon tax during today's press conference saying that growth and the economy takes precedence. "I think the American people right now have been so focused and will continue to be focused on our economy and jobs and growth that, you know, if the message is somehow we’re going to ignore jobs and growth simply to address climate change, I don’t think anybody’s going to go for that," said Obama. The idea of a carbon tax surfaced as lawmakers bear down on coming up with deal to avert the fiscal cliff. Question: Thank you, Mr. President. In his endorsement of you a few weeks ago, Mayor Bloomberg said he was motivated by the belief that you would do more to confront the threat of climate change than your opponent. Tomorrow you’re going up to New York City, where you’re going to, I assume, see people who are still suffering the effects of Hurricane Sandy, which many people say is further evidence of how a warming globe is changing our weather. What specifically do you plan to do in a second term to tackle the issue of climate change? And do you think the political will exists in Washington to pass legislation that could include some kind of a tax on carbon? 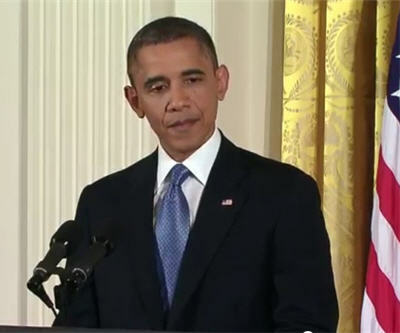 President Obama: You know, as you know, Mark (sp), we can’t attribute any particular weather event to climate change. What we do know is the temperature around the globe is increasing faster than was predicted even 10 years ago. We do know that the Arctic ice cap is melting faster than was predicted even five years ago. We do know that there have been extraordinarily — there have been an extraordinarily large number of severe weather events here in North America, but also around the globe. And I am a firm believer that climate change is real, that it is impacted by human behavior and carbon emissions. And as a consequence, I think we’ve got an obligation to future generations to do something about it. But we haven’t done as much as we need to. So what I’m going to be doing over the next several weeks, next several months, is having a conversation, a wide-ranging conversation with scientists, engineers and elected officials to find out what can — what more can we do to make short-term progress in reducing carbons, and then working through an education process that I think is necessary, a discussion, the conversation across the country about, you know, what realistically can we do long term to make sure that this is not something we’re passing on to future generations that’s going to be very expensive and very painful to deal with. I don’t know what — what either Democrats or Republicans are prepared to do at this point, because, you know, this is one of those issues that’s not just a partisan issue. I also think there’s — there are regional differences. There’s no doubt that for us to take on climate change in a serious way would involve making some tough political choices, and you know, understandably, I think the American people right now have been so focused and will continue to be focused on our economy and jobs and growth that, you know, if the message is somehow we’re going to ignore jobs and growth simply to address climate change, I don’t think anybody’s going to go for that. So you know, you can expect that you’ll hear more from me in the coming months and years about how we can shape an agenda that garners bipartisan support and helps move this — moves this agenda forward. Question: It sounds like you’re saying, though — (off mic) — probably still short of a consensus on some kind of — (off mic). President Obama: I — that I’m pretty certain of. And look, we’re — we’re still trying to debate whether we can just make sure that middle-class families don’t get a tax hike. Let’s see if we can resolve that. That should be easy. This one’s hard. But it’s important because, you know, one of the things that we don’t always factor in are the costs involved in these natural disasters. We’d — we just put them off as — as something that’s unconnected to our behavior right now, and I think what, based on the evidence, we’re seeing is — is that what we do now is going to have an impact and a cost down the road if — if — if we don’t do something about it.